The Serrated Volt II, designed by custom knifemaker RJ Martin, is a hard-working EDC with sleek style and excellent performance. The Volt II classic drop-point blade is perfect for just about any general utility task and the partial 2-step blade serration allows the blade to whip through tough and fibrous materials such as rope, webbing, and cord. The 3.25” blade is made of 8Cr13MoV stainless steel and heat-treated to bring out the steel’s high-performance characteristics of hardness, strength, and edge retention. The Volt II’s glass-filled nylon handle is countered for comfort and features a diamond pattern grip for a strong hold. Heavy jimping along the blade’s spine provides a sturdy thumb rest. 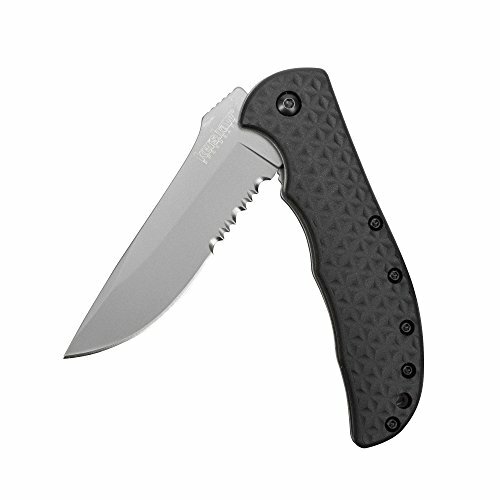 Equipped with Kershaw’s patented SpeedSafe assisted opening system, the serrated Volt II can open with one hand for lighting fast blade access. A secure liner lock in the handle ensures safe, confident blade lockup, preventing the Volt II from accidentally closing during use.